Murfreesboro has seen it’s share of extreme weather. This is why we want to help Murfreesboro business owners with any foundation problems that come up. Foundations can break down under extreme pressure and time, depending on the way the building was constructed. Pressure from loose or poorly compacted soils as well as excess water can cause the walls of your Murfreesboro business storefront to lean, bow, or crack. You might notice settlement in your structure, with signs such as wall and floor cracks, drywall cracks, sloping floors, garage column and slab cracks, and stoop or stairs that pull away from the foundation. Atlas Piers of Atlanta offers many services to help fix your home or business’ foundation problems. Underpinning may be your best option. 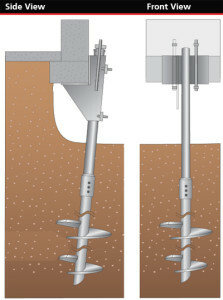 Underpinning involves helical or resistance pier installation beneath preexisting walls. These piers help transfer the weight of your home to more stable soil further into the ground, preventing sinking and lifting your home back into its original position. Another option for your home may be carbon fiber strips, the eco-friendly alternative to underpinning. Carbon fiber strips are applied to your wall and can be easily painted over for low visibility. They help repair wall cracks and can even strengthen bowing or leaning walls. Other options for your home may include helical tiebacks, which strengthen bowing and leaning walls, crawlspace encapsulation, which can waterproof your crawlspace and prevent further water damage, and pressure grouting. For pressure grouting, the professionals at Atlas Piers of Atlanta drill holes into your concrete and insert a high concentration concrete solution. This can help fill voids under your concrete that may be causing the sinking and cracking. Whatever your foundation repair needs are, know that Atlas Piers of Atlanta is available to help the home and business owners of Murfressboro, Tennessee. Call us today for a free estimate.